Since global markets declined around August and some markets recovered much of their losses by November, global markets have declined again. Below are charts of U.S. stocks, International stocks, U.S. bonds, and commodities. Even the iShares iBoxx $ Investment Grade Corporate Bond ETF that seeks to track the investment results of an index composed of U.S. investment grade corporate bonds is near -8% from its peak. Small and mid companies U.S. stocks are down more than -20% from their peak. Commodities and emerging countries are down the most. This all started with investors being optimistic in late October as I mentioned in Fear and Greed is Shifting and Models Don’t Avoid the Feelings. So, it is no surprise that today is just the opposite. As markets have declined investors become more and more fearful. As of now, Extreme Fear is the driver of the market. 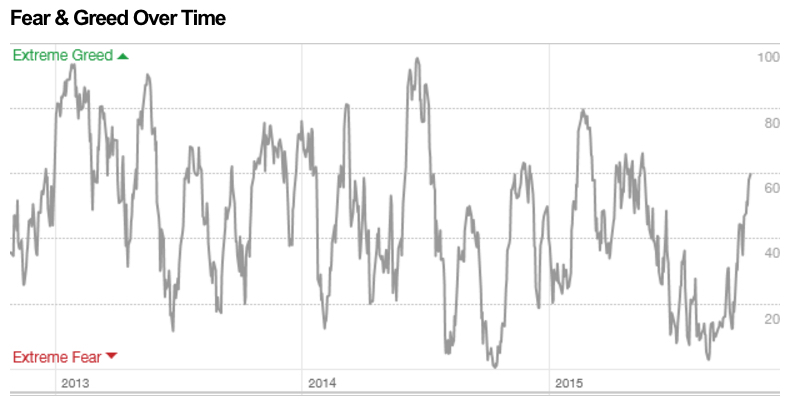 Below is the current reading of the CNN Fear & Greed Index. As you see in the chart below, it’s now getting close to the Extreme Fear levels that often signal at least a short-term low. Another publicly available measure of investor sentiment is the AAII Investor Sentiment Survey. 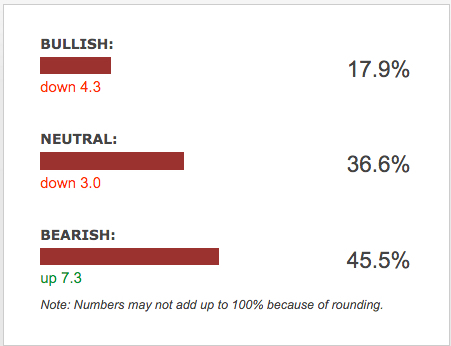 The AAII Investor Sentiment Survey measures the percentage of individual investors who are bullish, bearish, and neutral on the stock market for the next six months; individuals are polled from the ranks of the AAII membership on a weekly basis. The most recent weekly survey shows investors are very bearish and again, such pessimism occurs after price declines and at such extremes sometimes precedes a reversal back up. I say again what I said in October: This is the challenge in bear markets. In a bear market, market prices swing up and down along the way. It’s these swings that lead to mistakes. 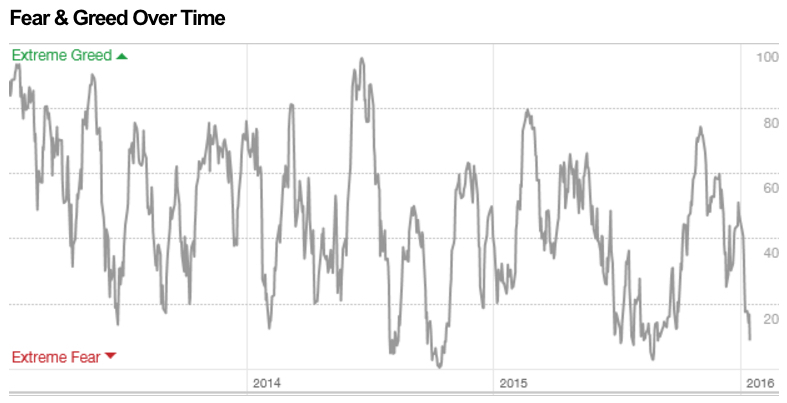 Above was a chart of how the Fear and Greed Index oscillates to high and low points over time. Investors who experience these extremes in emotion have the most trouble and need to modify their behavior so they feel the right feeling at the right time. Or, hire a manager with a real track record who can do it for them and go do something more enjoyable. As investors become more risk-averse, the model becomes more defensive. When investors become more risk-seeking, the model becomes more offensive. That surprises me because investor sentiment is usually used as a countertrend indicator, not as a trend following indicator. Investors often get overly optimistic after prices have trended up and investors get more afraid after prices have trended down. They went on to say they also use economic indicators as their signal to increase and decrease exposure. I am always concerned when I hear of someone using anything other that the direction of the price trend itself. Other indicators like credit spreads or perceived risk premiums are derivatives of price and it’s the directional movement of the price trend itself we really want. If the price gains 5%, we make money. If the price loses 5%, we lose money. If the price does nothing and the ratio or spread you rely on goes up or down, it did nothing for you. If you use something that is a derivative of the price itself, you have the potential to stray far from the price trend itself. All blow-ups in history started that way. Investor sentiment is usually wrong. It isn’t something I’d want to follow. If anything, I’d want to do the opposite of investor sentiment when it reaches an extreme. 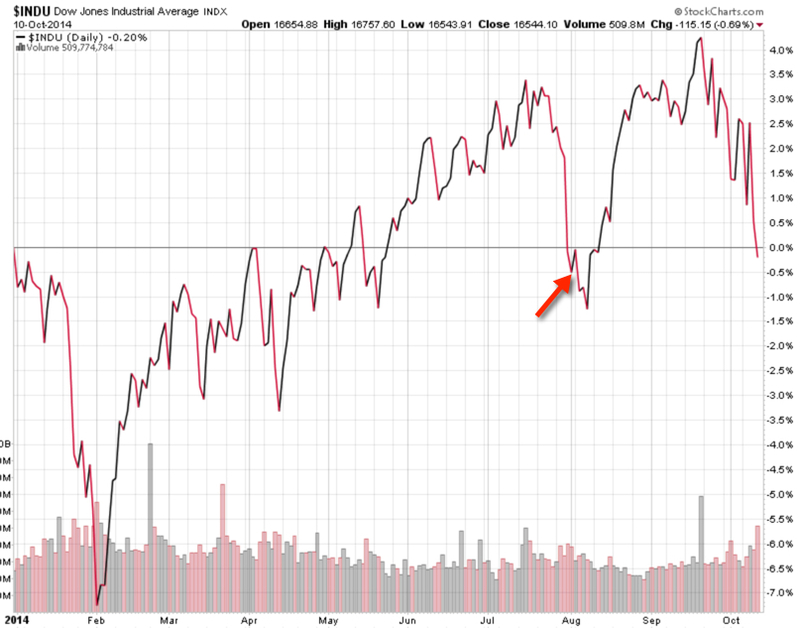 I occasionally point out my observations when investor sentiment reaches an extreme. When I do, I’ll highlight a simple sentiment gauge that is publicly available on the CNN Money website. Now, that gauge doesn’t actually have a signal that says when it has reached an extreme. It’s just a gauge to swings from one extreme to the other and spends a lot of time in between. It isn’t what is telling me to share my observations – it’s not my signal. I have other systems for actually doing that, but my systems often coincide with extreme readings in the Fear and Greed Index. As of Friday, fear is driving stocks. A few weeks ago I pointed out “It’s official: extreme greed is driving the stock market”. Prices had been rising and investors became more and more optimistic. Stocks have now fallen about 3 – 4% and investor sentiment quickly shifted from “Extreme Greed” a few weeks ago to “Extreme Fear” now. 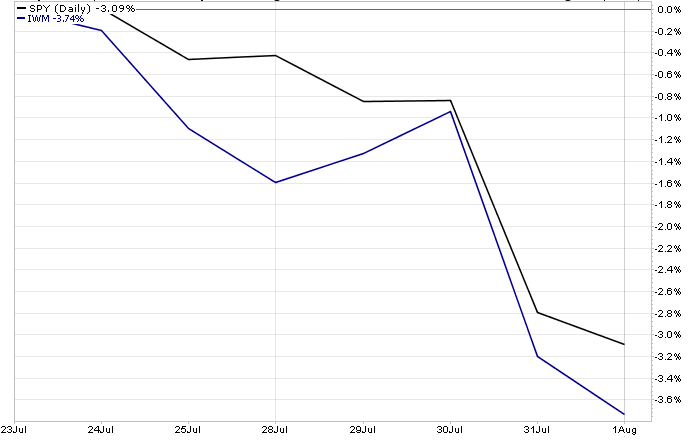 The stock market had gone months without a 1% move, so a -2% down day got their attention. Investor sentiment isn’t necessarily and indicator I use to increase and decrease exposure, but instead one that is useful to help investors understand problems in their behavior. 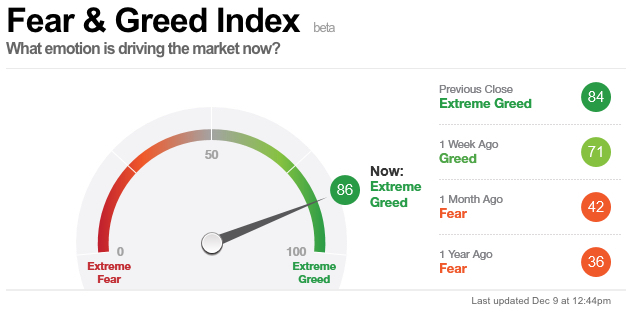 If you find yourself getting more aggressive after prices have already made a big move, or scared after price declines, you may find it useful to monitor the Fear and Greed Index to help adjust your behavior. That money manager may be one of them. If anything, you may find increasing and decreasing exposure to risk is best done opposite of sentiment extremes, not along with it. Investor sentiment is usually wrong, not right. 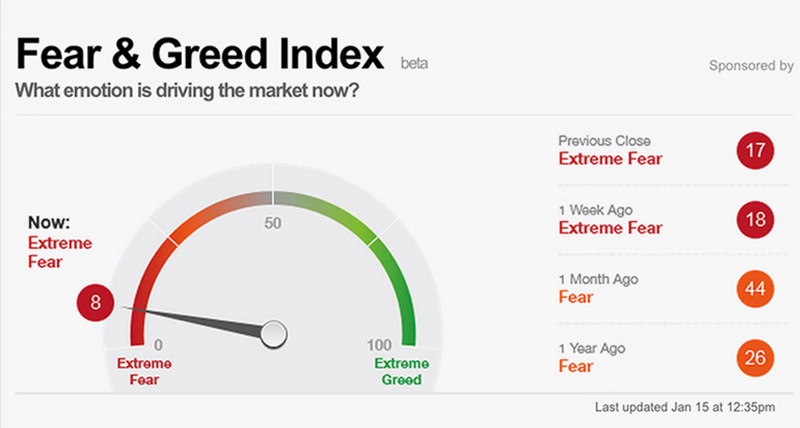 Extreme fear occurs at lows, extreme greed at highs.